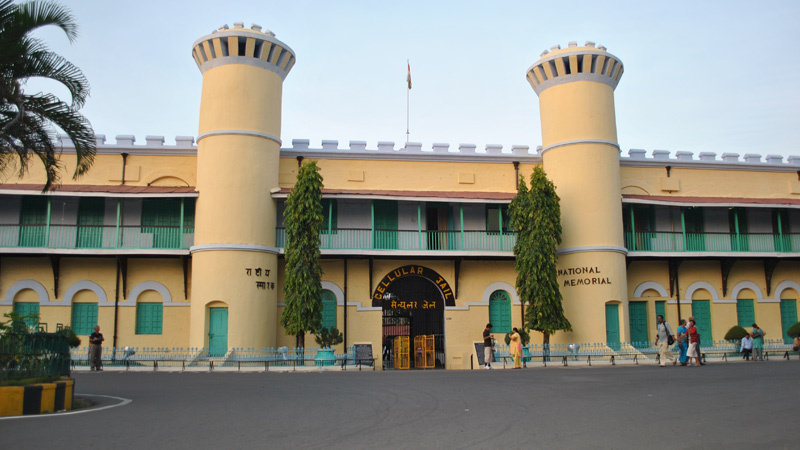 Cellular Jail is the infamous colonial prison of the British era. Today, the building stands as a mute witness to all the wrongs of the past. Each of its cell shrieks the wrong done to humanity. It is currently a national memorial. Visit to the Andamans can never be complete without a visit to the Cellular Jail located in Port Blair and the light and sound show orchestrated every evening is a must-see agenda while on an Andamans trip. The Cellular Jail is a living saga of struggle and pain of thousands of Indian freedom fighters. Each prison cell articulates the inhuman torture that the heroes have met and the sacrifice they made to earn freedom for this great nation. The light and sound show conducted every evening for an hour sends shivers down the spine and makes the hairs stand on end. As we hear the stories in Om Puri’s voice of the inhuman punishment and the inhuman labour that were forced upon the brave sons of the soil, we feel tormented. Each cell is lighted up with a weird hue and the narrative brings to life the spirits of the agonised souls. Each parapet and each stone of the seven-winged pronged structure of the Cellular Jail stands a proud witness proclaiming the glory of the illustrious dissidents such as Batukeshwar Dutt, Yogendra Shukla, Vinayak Savarkar, Shadan Chandra Chatterjee, Upendra Nath Banerjee, Nand Gopal, and many others. The story relates how a conspiracy cooked up and in 1868, 238 prisoners tried to escape. They were unfortunately caught and as many as 87 of them were hanged mercilessly. History ghalso narrates how Mohandas Karamchand Gandhi and Rabindranath Tagore intervened to the relief of the inmates. The fresh painting and restoration work of the hanging cell where three inmates were hanged together have not done much to erase the pain and stigma attached to humanity. It is open for curious visitors. From the ramparts of the three-storeyed brick structure, you can view the pleasantly blue seas surrounding the island, the legendary Ross Island lying just across in front and the adventure-filled North Bay Island a bit towards the left. The prison was built during the years from 1896 to 1906. The building was originally puce coloured and constructed with the rocks imported from Burma. The building was designed as a seven-winged structure with a tower at the centre. The central tower served as a watch tower by the British employed guards to keep a vigil on the inmates of the cell. The seven wings are spread in a straight line and the entire design resembles the spokes of a wheel. There was also a large bell hung from the middle tower to raise an alarm in case of any kind of emergency. Each cell was design for solitary confinement to prevent the freedom fighters and revolutionaries spawning collective fresh ideas to free their beloved motherland from British occupancy.